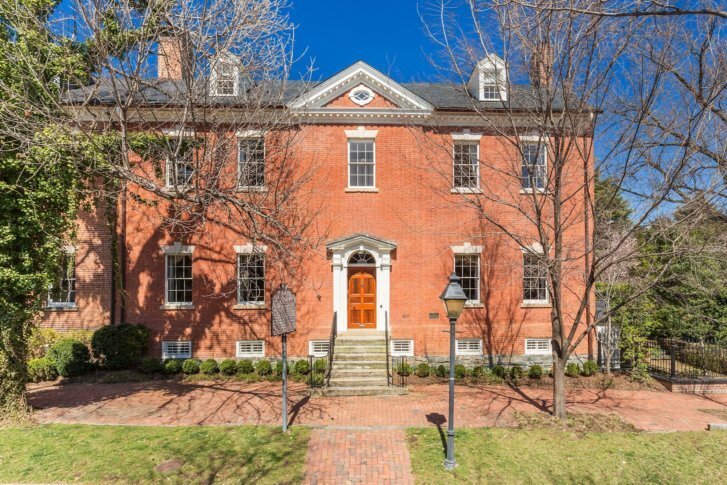 A historic home for sale in Old Town Alexandria, Virginia, built in 1795 that served as the boyhood home of Confederate Gen. Robert E. Lee just had a big price cut. Originally listed for $8.5 million in April 2018, the listing price has been reduced to $6.25 million. The home, at 607 Oronoco Street, is listed by Robert Hryniewicki, Adam Rackliffe and Christopher Leary of HRL Partners with Washington Fine Properties. The current owners purchased the home in a private sale in 2000. Hryniewicki calls them “empty nesters” who no longer need such a large home. It is also the first time the home has been publicly listed for sale in 50 years. The 6-bedroom, 4 1/2 bath, three-story home is roughly 8,100 square feet and sits on a half an acre of gardens. The listing says it has been subject to a detailed and complete restoration as a newly-functional structure in an antique envelope. The home is a registered Virginia landmark and is listed on the National Register of Historic Places. The home was originally built in 1795 by John Potts and sold to William Fitzhugh, a delegate to the Continental Congress for Virginia in 1779. The Lee family moved into the home when Robert E. Lee was 5 years old in 1812. Lee lived there until 1825.